Back in September we pointed out that the organization was surprisingly old for a Expansion franchise. At the time, Misha Donskov at the age of 39 was the youngest member of the staff and the average age of the men in the room was over 50. A few days later 25-year-old Raphael Pouliot was hired. Since, some younger guys like Mike Levine, Tom Poraszka, and Peter Ward were brought on. We figured the reasoning behind the more youthful hires was not George McPhee reading SinBin.vegas, but for a minute there we were walking out with our chests out. Come to find out, thanks to a Sportsnet article, it was actually the idea of 47-year-old Scott Luce who had to do a little convincing of his new boss. A big talking point at the GM meetings, which George McPhee was not invited to, was the idea of under-the-table deals with free agents. Current GM’s are afraid McPhee and Las Vegas will take advantage of their two day window before the Expansion Draft while McPhee’s concerned unprotected players will already have deals in place with their existing teams. The league has weighed in and said they are planning on punishing teams that try these antics. Let me explain using an example similar to one we’ve used before. Patrick Sharp is an unrestricted free agent come July 1st, 2017. Until that day, only the Dallas Stars can negotiate a contract extension with him. However, Las Vegas will have the opportunity to speak to Sharp for two days prior to the Expansion Draft. Naming the franchise was a major step in the growth of Las Vegas’ first major professional sports franchise, but the list of steps is still massive between now and puck drop in October 2017. One of the most important moments for the Vegas Golden Knights will be the naming of the first head coach. The Creator weighed in on what type of guy George McPhee is looking for in an interview on SportsNet’s Prime Time Sports. Names being thrown around are Mike Kitchen, Paul Maurice, Ralph Krueger, Jack Capuano, Paul McLean, among many others. Many names being considered are current coaches in the NHL. So we’ll probably still have to wait another six months or so to find out who it is, but we do now know the man standing behind the bench for the first season of NHL hockey in Las Vegas will be someone we’ve all seen before. November 22nd, 2016 will go down in the history books forever. Tonight an organization that was considered to be a pipe dream or a joke of a thought by many will get it’s name, and in turn, it’s identity. I know it’s just a name, but it’s a name that will find it’s rightful place in the history books of one of the most colorful cities in the world, Las Vegas. Every once in a while we get sentimental about these things, and this is one of those moments. Here is exactly what tonight means to us. Jason Pothier – Five years ago, I couldn’t believe the lack of hockey interest in this town. I thought I had hit the jackpot when I realized I could watch two NHL teams. The Ducks and Kings helped me get over any East Coast homesickness. I’d try and talk hockey to anyone I bumped into. It took a guy named TBone, and a guy named Ken to listen. After that it was on for Ken and I. We squeezed in hockey talk during our two-hour football show weekly. We covered the preliminary NHL press conferences. We believed when others thought we were wasting our time. Our hard work was a pipe dream to most. Today that pipe dream is real. Driving to LA, Anaheim, or Phoenix is no longer necessary. When I introduce my 8-month-old son to hockey I’ll only drive 20 minutes down Trop. It may have taken a while, but the wait was worth every failed attempt before. We’ve been called annoying, we’ve been told we’re uninformed and undeserving. However, none of that noise matters now. Call us what you want but call us Knight fans first. Ken Boehlke – For me tonight is not about hockey, it’s about Las Vegas. One of the fastest growing cities in the world and the only place I’ve ever been truly proud to call my home. However, Las Vegas has had a gaping hole for a long time, the lack of a major professional sports team. No matter who you are, or how long you’ve known me, you know my passion for sports. So when my wife and I moved out here many questioned how I’d survive in a place that lacks the thing I love most. On June 22nd that changed, but tonight it really changes. I’ve always been a fan of Las Vegas, the city. I’m a fan of the Tampa Bay Buccaneers, the Chicago Bulls, and the Missouri Tigers but I’m not a fan of Tampa, FL, Chicago, IL, or Columbia, MO. Finally it’s time I get to love both halves of the team name I root for, and I’m pumped to learn the identity of that second half. Now it’s your turn. What does tonight mean to you? Post it in the comments, we can’t wait to read em. New franchise. New competition. New passion. More than just a new franchise. No less than the start of a dynasty. Under the brightest lights, their legacy will be created. It’s not only history being made here in Vegas, but it’s also the first time Adidas has been involved with the NHL. They might be just as excited as we are. Anyone else notice the word “desert” in that first tweet? They telling us something? Remember that email that got us all jazzed up about the color scheme? (If not, that’s what blue text is for. Click them, it makes this site better believe me) Well that very same email may have also had another little nugget hiding in the header. 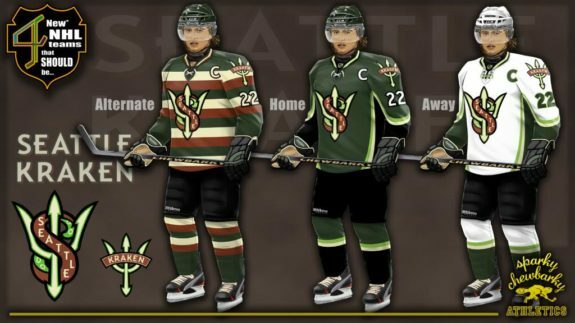 Superstar graphic designer Sparky Chewbarky, you may remember him from such designs as the Las Vegas Black Knights, Las Vegas Silver Knights, the Seattle Kraken, and the Halifax Highlanders, recognized something many others pointed out. It appears at the very top of that same email, which is pictured below, that there’s an outline of the letter V. I’ll stop talking and just let Sparky do his magic. Last night, SI.com writer Alex Pruitt reported an entourage of Las Vegas scouts in DC. Pruitt, who’s one of the few covering the NHL’s 31st franchise on the national level, tweeted six Las Vegas officials were credentialed for the Capitals and Red Wings matchup. The heavy presence suggests they were scouting several players at last night’s 1-0 Capitals victory. Let’s take a shot at what players Las Vegas scouts kept an eye on. The 31 year-old, right handed defenseman could be very appealing to Las Vegas scouts. Green is in his 10th season, and overall he’s been a very good player. He’s had some brilliant offensive stretches, including a combined 68 goals from 2007-2010. Very impressive offensive numbers for a defenseman averaging 3 shots a game during that run. However, “Greener” has tailed off over the past few seasons. Green offensively is known for his efficient slap-shot, and was affectionately nicknamed “Game over Green” by Washington fans. Green is in his second season with Detroit, and will have one more year remaining if the Knights select him. It would be a sizable $6mil cap big hit for Las Vegas, but if he’s available he’s worth the price. Just a few years removed from being one of the NHL’s elite goaltenders, the 32 year-old Howard is destined for the Expansion Draft. Detroit will most certainly continue to go with Petr Mrazek as their future net-minder. In fact, there are rumors that Howard could be traded this season. If that’s the case, the former Maine Black Bear could still be left unprotected by whatever team he lands with. Howard’s age, contract, and steady decline are mainly why a team would only use him as a post-season rental. Sure, Howard has had some good seasons, but I doubt he’ll be George McPhee‘s best option in 2017. The practice facility set to become the new every day home of the Las Vegas franchise officially broke ground on October 5th and the expected completion date is sometime in August. Located in Downtown Summerlin the facility will have all team offices, two full size sheets of ice, a team store, and a restaurant that overlooks the entire thing. Vegas Helicam has been documenting the progress of the facility using some sweet technology in which they fly a drone over the site and capture slow motion videos and high resolution pictures. In the video below you can see the layout of the sheets of ice and you can really get a feel for the sheer magnitude of the facility. Pretty cool stuff. On 2:01 PM PST, Monday, November 7th the new Las Vegas franchise made big news… or at least they tried to. While you were completely wrapped up in the biggest Presidential election ever, the team was trying to get your attention. Last week, the son-to-be Knights confirmed the logo/name reveal celebration for November 22nd. News we’ve known, but have been waiting to be made official. However, odds are you might not have noticed. The strategy and timing of the press release seemed delayed, but in a way rushed too. No matter which it was, the fact remains, there’s no logical reason for that release to have come out at that time. I hate being picky, but I’m questioning the strategy of whoever decided to release reveal date last Monday at exactly 2:01 PM PST and here’s why. Let’s start with the day, Monday. When a sports team releases news on a Monday, it’s competing with other non-sports stories that gathered over the weekend. Plus they’re competing with NFL Sunday news half the year. Monday’s and Friday’s are days to release bad news or boring news. Friday is normally the day organizations fire their coach. Monday’s are the day to release news that won’t trend (or so you hope) on social media. So Monday was bad enough, and I haven’t even started on last Monday. SinBin.vegas Podcast #44: Do You LARP? The conclusion of the bad neighbor story, another look at the unveil event, and learning from the John Spano incident. Hosted by Ken Boehlke and Jason Pothier. Jason’s connection to hip hop music upsets Ken. NHL email from Uncle Frank about docking draft picks if teams circumvent the Expansion Rules. We are all meeting up at Beerhaus at 3PM on November 22nd. Please join us before the event. LARP, NERO and the people who play it.